Perennial herb, mat-forming with numerous leafy stolons 1-6 cm long; stems erect, several, branched above, densely woolly-hairy and glandular above, 8-40 cm tall. Basal leaves spoon-shaped to broadly lance-shaped, grey to white woolly-hairy above and below, 6-30 mm long, 2-8 mm wide, abruptly sharp-pointed, with a sharp, slender tip; stem leaves similar, 5-30 mm long, linear to lanceolate, abruptly sharp-pointed. Heads several to many in compact, rounded cluster; involucres of 2 types, the female ones 5.5-7.0 mm tall, hairy at the base, the male ones similar, 5.0-6.5 mm tall; involucral bracts lanceolate, the upper papery portion white to light yellow, often greenish at the base; female flowers 3.0-4.5 mm long, male flowers 2.5-3.0 mm long. Female achenes 0.6-1.2 mm long, glabrous or sparingly warty, the pappus white with hairlike bristles, 3-5 mm long; male pappus hairs club-shaped and toothed at the the tips, 3-4 mm long. In recent years, some taxonomists (e.g., Hitchcock and Cronquist 1973; Douglas et al. 1989, 1995) merged both A. nitida and A. rosea with A. microphylla. Bayer and Stebbins (1993), however, have separated the latter from A. rosea. Upon examining hundreds of herbaria sheets of A. microphylla (which included those recognized by Bayer and Stebbins  as A. rosea) at the Royal BC Museum, it appears that of all the plants which had white or yellowish-white (as stated in Bayer ) involucral bracts, only a small percentage had glands on the upper stems. 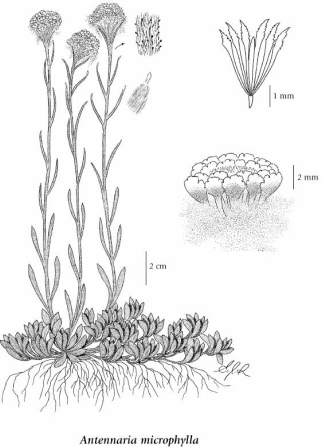 Therefore, A. microphylla as circumscribed by Bayer and Stebbins (1993) is infrequent in BC. Mesic to dry slopes and open forests from the lowland to the alpine zones; infrequent throughout BC, except absent on N Vancouver Island and the Queen Charlotte Islands; N to AK, YT and NT, E to PQ and S to NM.